“Peace-Walk to learn from the Battle of Okinawa” was held on May 1, starting from the Haebaru Imperial Japanese Army Hospital Cave, Haebaru Town, and finishing at the Itokazu Cave Abuchira-gama in Nanjo City. This was the second time that such a Walk has been held this year. Some sixty participants, aged from elementary school children to people in their 70s, took as long as three hours to walk the distance of about nine kilometers in light rain. On the Walk they listened to stories of survivors and to explanations from volunteer guides at the caves, experiencing for themselves an aspect of the war and appreciating the preciousness of peace. Held since 2010, the first Peace-Walk of this year was held on April 1, the day that U.S. forces landed on the main island of Okinawa. 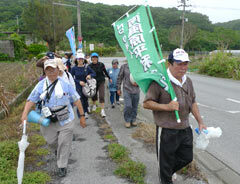 The participants started from Sunabe in Chatan Town and walked to Nodake in Ginowan City, where the holding camps were located. The latest Peace-Walk was timed to coincide with the date of some of the Himeyuri Corps moving to the southern part of the island. Before the participants went into the Abuchira-gama Cave, they listened to the experiences of a survivor of the Himeyuri Corps, 83 year-old Yoshi Shimabukuro, who now lives at Naha City. 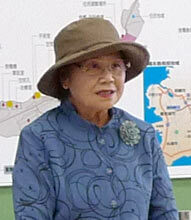 Shimabukuro tended to wounded soldiers as the fighting in the Battle of Okinawa reached its peak. After departing from Haebaru on April 28, 1945, she reached Abuchira-gama in the morning of May 1. Touching upon her terrible experiences nursing the soldiers in the shelter, she recalled: “At the beginning, we were scared of the maggots that came out of the men’s wounds, but there were so many soldiers to care for that we just got used to it. Many died still believing that reinforcements were on their way. I can never think that war is permissible,” Shimabukuro said. Forty-nine year-old Haebaru resident Masatomo Shiroma and his 11 year-old son Tasuku said, “We were surprised at how small the hospital cave is inside. The distance to walk was more difficult than we had expected, so it must have been really tough back then. ” The Executive Committee will hold the Peace-Walk on around June 23, Battle of Okinawa Memorial Service Day, and around September 7, which was when the surrender document was signed by representatives of the Imperial Japanese Army on the Ryukyu Islands, and the United States Forces.